WASHINGTON, D.C. -- In contrast to President Donald Trump's call for a massive increase in U.S. military spending, most Americans believe the country currently spends either the right amount (28%) or too much (31%) on national defense. Thirty-seven percent believe it spends too little. Still, slightly more Americans say the U.S. spends too little on defense than say it spends too much. This has happened somewhat infrequently in Gallup's trend since 1969. All of the instances in which "spends too little" has exceeded "spends too much" have come just before, or just after, a Republican presidential administration has replaced a Democratic one. Before the 2016 presidential campaign, the last time that Americans were more likely to say "too little" than to say "too much" was 2000-2002, spanning the 2000 election as well as the aftermath of 9/11. The percentage saying "too little" also exceeded the percentage saying "too much" when Ronald Reagan took office in 1981, after campaigning on a pledge to rebuild the military. 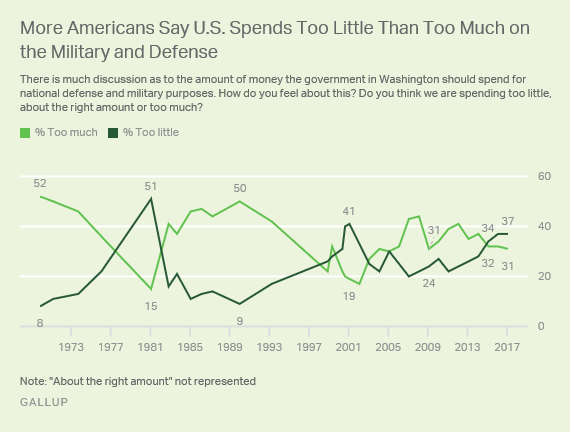 At that time, half of Americans thought there was too little defense spending, the highest in Gallup's trend since 1969. Only 15% thought there was too much -- the all-time low. The latest findings from Gallup's Feb. 1-5 World Affairs poll come as President Trump proposes a $54 billion increase in military spending in his first federal budget plan. While Trump's position on defense echoes Reagan's, the percentage of Americans saying the U.S. spends too little on defense is lower now than during Reagan's first month in office. This may be related to fatigue from a continuing war in Afghanistan and the recent Iraq War. The view that the U.S. spends too much on the military reached 50% or more during the Vietnam War era of the late 1960s and early 1970s, as well as in 1990, after the end of the Cold War and an extensive military buildup under President Reagan. 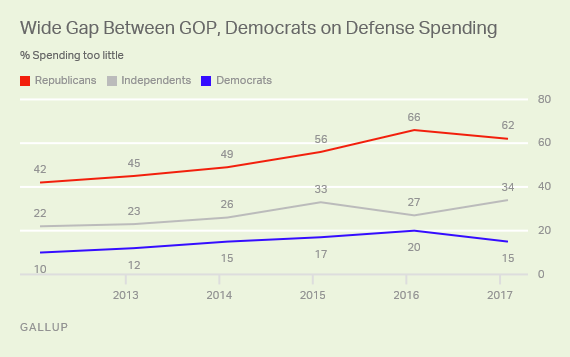 While 62% of Republicans say the U.S. spends too little on defense, 15% of Democrats hold that view. Though this sentiment has increased among both major party groups since 2012, it is up 20 percentage points among Republicans and five points among Democrats -- despite a slight dip for both parties in 2017. Gallup also asks Americans to assess the nation's military strength. Forty-five percent say the national defense is not strong enough, while 43% say it is "about right" and another 11% believe it is stronger than it needs to be. These views are consistent with beliefs about military strength in each of the past two years. Before 2015, significantly more said military strength was "about right" than said it was not strong enough. "About right" is often the dominant choice on this question, in times of peace and war. The highest sentiment of "about right" occurred in January 1990 at a time of relative peace and after an unprecedented military buildup. 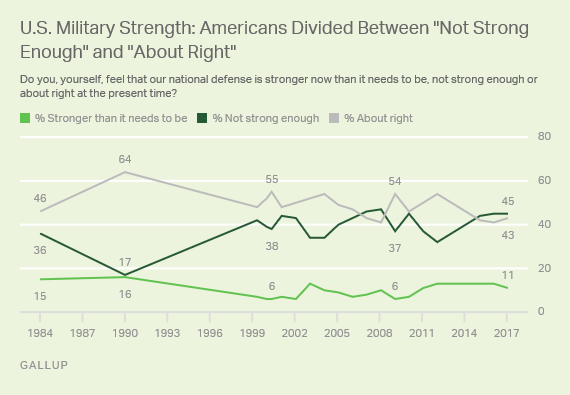 That year, 64% said the nation's defense was "about right," as opposed to 17% calling it "not strong enough" and 16% saying "stronger than it needs to be." President Trump's view that the military should be strengthened may find an appreciative audience with the public in some respects, as Americans consistently think highly of the U.S. military. But Trump may face some resistance to increased defense spending from those wary of the continuing war in Afghanistan and the recent war in Iraq. While views have wavered some over the past two years, Americans do not express a clear preference for an increase in defense spending, although that is the preference of Trump's GOP base. 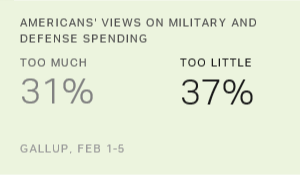 Overall, about six in 10 Americans say military spending is either too much or about right. Interestingly, more Americans say the country's defense is not strong enough (45%) than say the U.S. spends too little on defense (37%). Similarly, more say the government spends too much (31%) than say the nation's defense is too strong (11%). These discrepancies might indicate that Americans believe more can be done with less. President Trump faces a highly polarized nation, as did Obama and Bush before him. How he can most effectively deal with this divided nation remains his biggest challenge. While President Trump has previously characterized NATO as "obsolete," 80% of Americans think the alliance should be maintained.